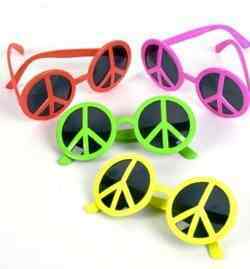 These Neon Peace Sign Sunglasses are perfect for getting groovy at your hippie-themed party. Sunglasses come in assorted colors of neon pink, green, red and yellow. Prefer a certain color? let us know in the comments section, and we'll do our best. No guarantees though. Each lens measures 2¼" in diameter.